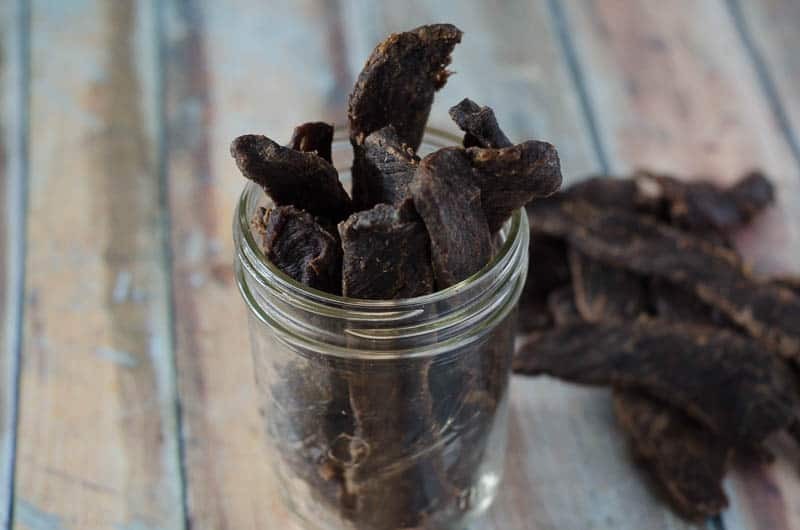 This simple beef jerky recipe is delicious, healthy and Whole30 compliant. You’ll never eat store bought beef jerky again! For those of you that know me, you probably also know by now that my husband Brandan loves his “meat projects.” This homemade beef jerky recipe is a recurring meat project in our house, and you’ll never hear me complain about it! 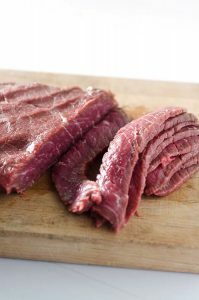 What is the best cut of meat for beef jerky? 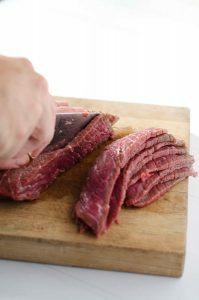 We’ve made this simple beef jerky recipe out of various cuts of meat over the years, but london broil comes out the best. It’s all in how you cut it, but if you do it right, it comes out thick enough to hold up to dehydration, but not so thick that you feel like you’re chewing on the bottom of a shoe when you eat it. How do you cut meat for beef jerky? 1. Press down on the piece of meat with one hand. Put pressure on it; just holding it is not enough. This is essential to the beef jerky science! 3. Press your meat. When you pick up your hand, are there indentations from you pressing down on it? If not, press harder. Now we’ve got our meat strips, but we’ve got to make our marinade. How do you make (sugar-free!) beef jerky marinade? In a large measuring cup (that’s a 4-cup Pyrex in that photo) or mixing bowl, whisk together all your ingredients except the meat. How do you marinate beef jerky? 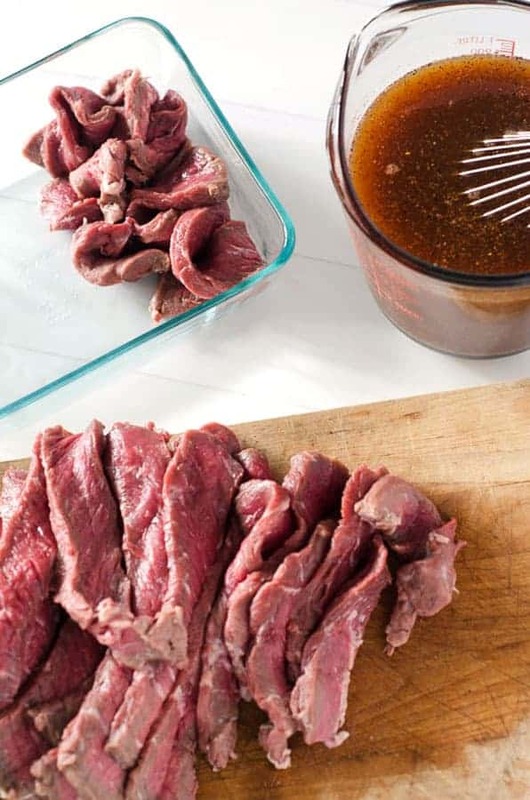 Start arranging your jerky slices in a flat pan or dish. You want to kind of twist and make circles and stand them on their sides in a single layer as best as you can – this is going to get the maximum surface area exposure to the marinade! Whisk your marinade one more time just to make sure it’s all well incorporated, then pour the whole mixture over the meat into the pan or dish. 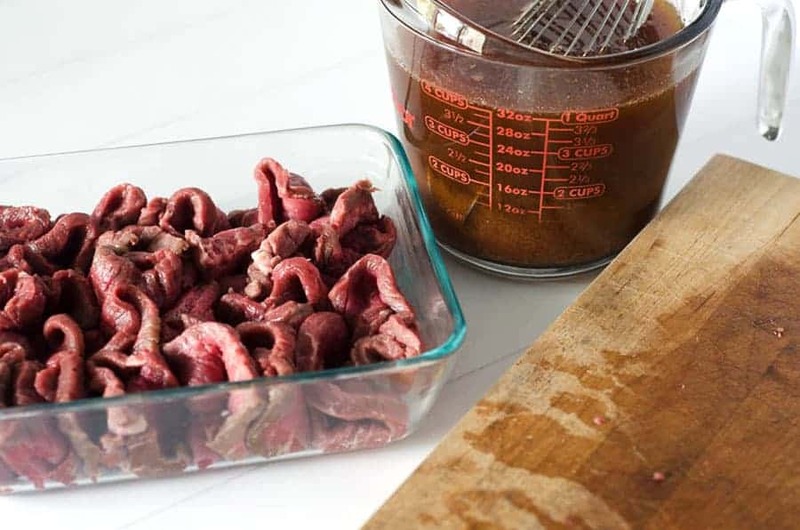 How long should you marinate homemade beef jerky for? You want to marinate it long enough that the meat absorbs the flavors of the marinade. We recommend about 48 hours, but you could do as little as 24 hours and as long as 72 hours and still get great and flavorful results. How do you dehydrate beef jerky? We use the Excalibur 5 Tray Dehydrator. It is hands-down the best dehydrator ever. We’ve tried a few different ones over the years, and the Excalibur brand is the bomb. If you do a lot of dehydrating, or are looking to start, I highly recommend getting one of these. Once we purchased it, we started making a lot more things in the dehydrator. 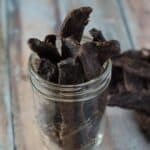 You can use it for this simple beef jerky recipe, but also dehydrating various fruits and veggies for healthy on-the-go snacks! To dehydrate your beef jerky, you’ll want to lay them out in a single layer on the trays. 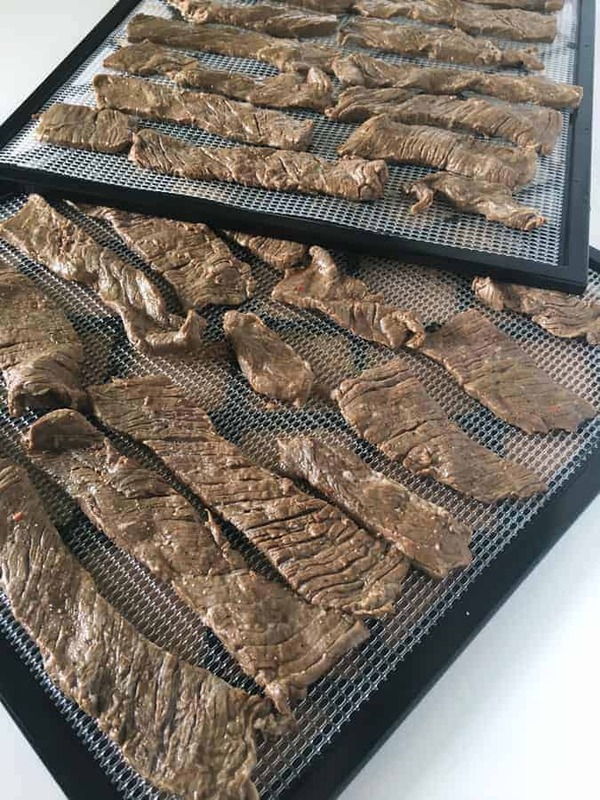 How long does it take to make beef jerky in a dehydrator? Insert the trays into the dehydrator and set to the jerky setting at 150°F. We cook ours for about 8 hours, but there’s more science involved here too – you have to watch the consistency of the meat, because dehydration depends on ambient temperature and humidity. I’d recommend checking it around the 5-6 hour mark periodically, stopping when it gets to the right consistency and moisture level you prefer. Can you make beef jerky in the oven? Yes! Follow all the steps above. Then when putting in the oven, make sure you have it on an oven-safe baking rack like this one with a baking tray underneath to catch any drips. Set your oven to the lowest setting possible. This is likely the “keep warm” setting – our “keep warm” is 170°F. You can go as high as 200°F and still be ok- you’ll just cook for slightly less time. Can you cure jerky for too long? Absolutely. If you over-dehydrate your beef jerky, you’ll end up with meat that is very tough to chew. You want it to maintain a little bit of tenderness, but get dry enough that it can be stored at room temperature without any issues. How long does homemade beef jerky last? In our house, not very long! You can keep this beef jerky at room temperature in a sealed container for about a week. We like to fold up a paper towel and place it in there with the jerky to absorb any excess moisture. You can also store it in the fridge for up to two weeks. This recipe contains no added sugar and no soy. It is the answer to your Whole30 snacks! You don’t need a dehydrator to make this, but it does make it easier. You can also make it in the oven. London broil makes the best jerky meat. You can marinate anywhere from 24 to 96 hours. Depending on the temperature and humidity in your home, drying times may vary. Be sure to check your beef jerky periodically during dehydration. If you’ve tried this beef jerky recipe or any other of my recipes on the blog, I want to see! Tag me on social media and follow along for more delicious recipes. You can find me on Facebook, Instagram and Pinterest to see more delicious food and what I’m getting into. An easy homemade beef jerky recipe that is both delicious and Whole30 compliant. You'll never eat store-bought jerky again! 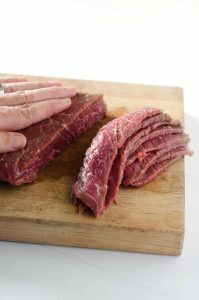 Using one hand to press down on the meat, thinly slice the london broil into strips, cutting across the grain of the meat. In a bowl, whisk together all other ingredients until well incorporated. Arrange the strips of london broil with "meat space," allowing for maximum exposure to the marinade. Pour the marinade over the meat, then cover and place in the refrigerator for anywhere from 1-3 days (at least 24 hours is recommended). 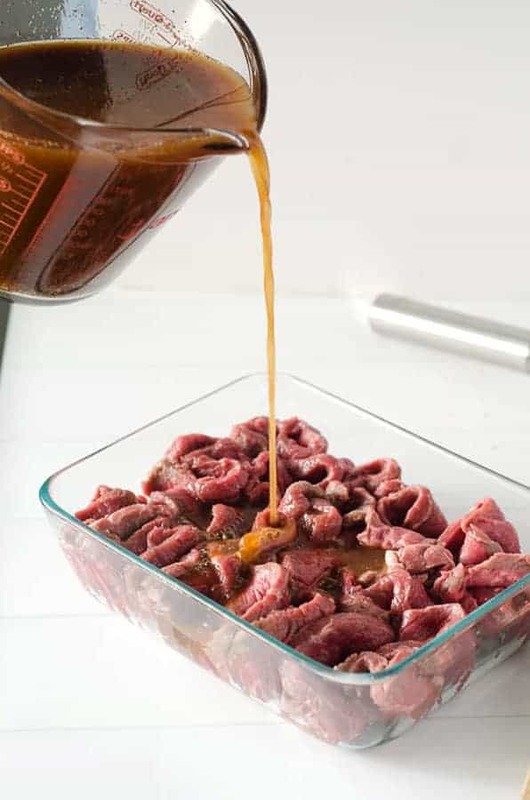 When ready to dehydrate, remove the meat from the marinade and place in a single layer on dehydrator sheets or on a baking rack on top of a baking sheet in the oven. When deciding how long to dehydrate, you have to watch the consistency of the meat. Dehydration depends on the ambient temperature and the humidity, so dehydration times may vary. After the first few hours, you'll want to check on it periodically to make sure it's at the consistency you want! I recommend this Excalibur dehydrator. It is the best!